Sometimes you don’t even realise that you’re taking a place for granted, but when I wrote this piece, I realised that was how I’d treated Leeds Castle. Back home in Kent, we can get to this grand old place in under an hour. It was always just there, a place we’d go when there was some sort of jousting event, or as a place to go for a wander after Sunday lunch. Honestly, I didn’t go to really experience the castle. I thought it would make a good piece for The Lighter Journal, and also there were a lot of rare Pokemon there in Pokemon Go. But today, I really let it all sink in. Leeds Castle is ancient. It was erected in 1119, making it almost 1000 years old. Entering the castle itself you find a hall decorated with a timeline spanning three walls, telling you the history of the place. From then on in, it becomes even more immersive. Rooms decorated as they would have been in Tudor times, with paintings of exquisitely dressed monarchs, and old medieval fireplaces. At Christmas all of this is decorated to the nines, each year a different theme*. It’s impossible to describe its beauty during the winter times, but it is definitely worth a visit. The next floor of the castle takes a turn, from ancient to relatively modern. Lady Baillie took control of the castle in 1926 and made the whole place a piece of artistic wonder. All of the furniture is beautiful and each room is colour coded, which is dreadfully satisfying. And yet nothing about the passing between old and (relatively) new is disjointed – it’s all just part of the castle’s history. After passing my favourite lion** statue, you re-enter the castle’s courtyard, and then it seems only natural to follow the path up to the gardens. A makeshift road surrounded by geese and swans leads you to a small cluster of buildings including a restaurant, a Costa and – my favourite – a dog collar museum. The latter had been closed for what felt like years, so it was a lovely surprise to be able to go in and look around. There are collars dating back hundreds of years to when dogs were used as hunters or entertainment in bear fights, all the way up to today where they have a collar from Sweep (from Sooty and Sweep, the children’s TV show). It’s only a couple of rooms but altogether a very sweet little museum. The rain began to hit us as we got towards the gardens. Before it became too heavy, we went to where the birds were kept – the ones that are for falconry shows and the such. *** They’re great, majestic creatures, and it seemed a shame to have them in captivity, but it’s a comfort to know that the castle will take good care of them. If we’d had more time I should have liked to go through the castle’s maze up to the fairy grotto in the middle, but I didn’t want to risk getting soaked. So instead we headed to a temporary tent which held an interactive exhibition about the Battle of Agincourt. It was great fun and a good way to keep dry for ten minutes as the rain petered out. The way back to the castle is just as lovely as the way there. You get a grand view of the castle from across the moat which lets you realise just how monumental the place is. 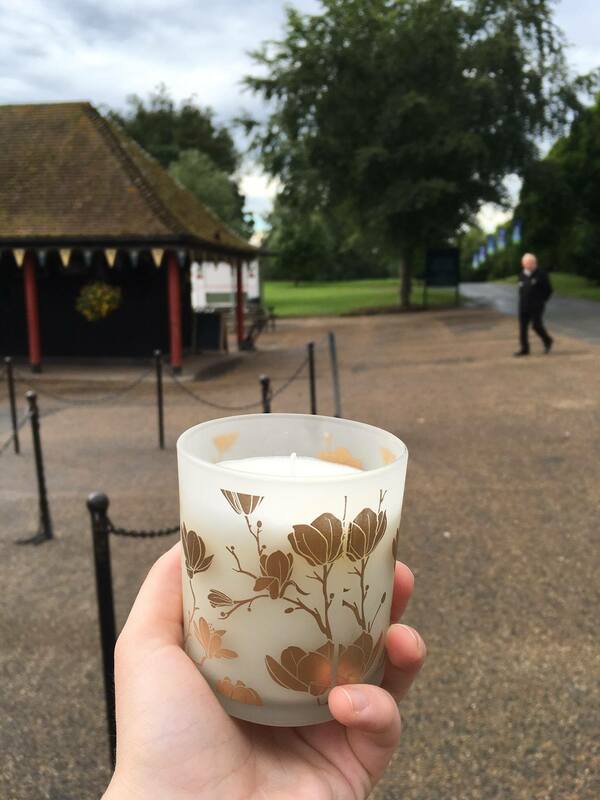 In the gift shop I elected to buy a candle in place of a lighter – a candle which they would have used to light the way in Tudor times, which Lady Baillie might have had on the table during some sort of fancy dinner party, one that will line the halls come Christmas. As I left the castle I was struck by this previous idea of taking things for granted. And my message to you, reader, would be – don’t do it. *I remember being captivated by the fairy tale theme when I was about fourteen – far too captivated for a fourteen year old honestly. **what is that. That’s not a lion. ***there was also a very young owl being taken for a fly but he wasn’t having any of it. He just sat on his tree stump and resolutely ignored his callers.